Now I can't speak for all woman/girls but I know most of us lovee anything that sparkles. 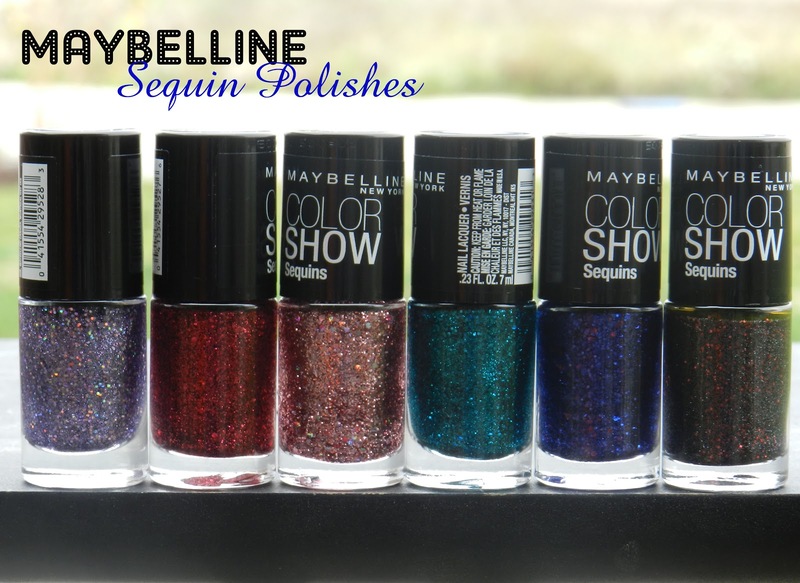 Today I came across these gorgeous limited edition Maybelline sequin polishes. I read that these were only available for the month of November so I decided to snag up what I could. 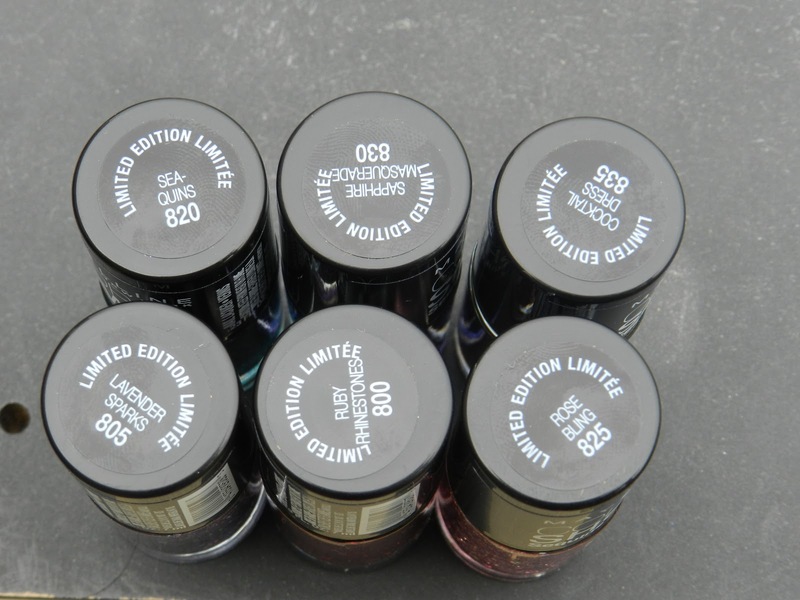 Their are 8 of these polishes. I decided to pick up 6 only because the other two were a gold and silver and I have plenty of gold and silver glitter polishes. Sea-quins- a bold turquoise base polish with chunky turquoise glitter. This swatched pretty well. It didn't take as many coats to be opaque as a few of the others did. Cocktail Dress- a grey base polish with chunky red glitter. Now this one was a little more difficult. It took a few coats for the grey to actually become opaque. The red really compliments the grey nicely and I think this would be perfect for fall. Rose Bling- a light rose goldish pink with chunky red and pink glitter. This was the worst to apply. It was very streaky and difficult to work with. It did take many many coats but take in mind I am applying it on plastic so it could be that as well. Ruby Rhinestones- a ruby red colored polish with a darker red chunky glitter.This color is going to be beautiful for the holidays. I absolutely love this one. Its pretty sheer but doesn't take much to make it opaque. Lavender Sparks- a light purple color with light blue glitter and a darker purple chunky glitter. This is a flattering color. Very playful and fun. It didn't take much for this to become opaque what so ever. Sapphire Masquerade- a vibrant cobalt blue base nail polish with red and darker blue chunky glitter. The application wasn't bad, and didn't take much to be opaque. This ones probably my favorite out of the bunch! If you into glitter polishes then I definitely recommend these. They're super inexpensive and totally worth the price considering many polishes now a days are $8+. I found these for $3.19 such a steal. Like many glitters they are a little more difficult to work with and such a pain to remove. However I did a post a while back on how to remove glitter polish here. More then likely I will be using these on my accent nails rather then on all my fingers only because I'm so impatient when it comes to removing your nail polish and sometimes I don't want to go through all the hassle. Now I'm not saying I'm totally never going to but majority of the time I'll be using it on one or two nails. Overall for the price, and considering their limited edition I would pick up what you can. Maybelline also released some nail polish strips with this collection if your more into those. I think I may try to grab lavender sparks & rose bling! Those colors are so pretty. I love the sparkle. 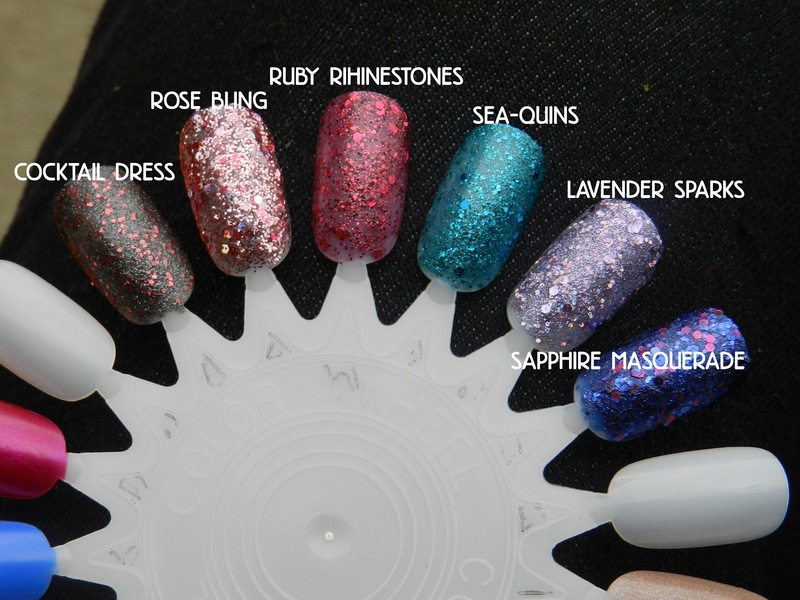 My favorite is Sapphire Masquerade. do you know where i can get these? i need these in my life hahah!